So that's it from me. Thanks for getting involved as we looked at the reaction to Monday's games and looked ahead to the rest of the midweek action. We'll be back later for live text commentary on the Champions League (Barcelona v Man Utd plus Juventus v Ajax) as well as the Premier League relegation battle between Brighton and Cardiff. I'm about to wrap things up for the time being but first, here's a reminder about today's gossip, which features Manchester United striker Marcus Rashford being linked with a £100m move to Barcelona. I missed this earlier but it seems the man who wore an Oasis-style cagoule on the day he was presented as a Manchester City player has just told his team-mates they need to "roll with it" in their bid to win a quadruple. Noel Gallagher would be proud! Defender John Stones said at City's news conference today: "These sorts of games bring out the best in us. We have to trust in ourselves and our team-mates and perform on whatever day we have a game. If we (man Utd) can score in the first half without reply, we will win the tie!! Man Utd have a chance if they score early. If Barca get first goal it's game over. After early euphoria over excellent results, Man Utd have become quite pedestrian in their matches under Ole. Barca are a far superior side and Man Utd could get a heavy defeat tonight. Man Utd defense are poor. Barcelona are unbeaten in 30 Champions League home games but Manchester United boss Ole Gunner Solskjaer said: "We know we can still be in this tie if we keep a clean sheet. In the 93rd minute, if we get a set-piece, we are taller and bigger than them. On what United's 3-1 win at Paris St-Germain in the last round did for their confidence, he added: "It will have helped us as a team. We know we can turn things around. "Barca here at the Nou Camp is a difficult prospect but that night will live with the players. It was not that long ago and we are one goal better off [than we were then]." Go on Hardeep, fess up....did you hear that Dwight Yorke interview before you sent this? What OGS should be saying, ‘Right lads, nobody expects us to come away with a victory tonight. So just go out there and play like you have nothing to lose!’ And it just might work. Manchester United have to overturn a 1-0 deficit from the first leg and former United striker Dwight Yorke told BBC Radio 5 Live earlier: "No doubt the manager will try to energise his players, but you don't need to energise players at this level, when there's such a crucial game at stake. "United have got nothing to lose. I think everyone thinks that they're second [favourite] going into this second leg. I think the players have just got to embrace it and go out and have a go at Barcelona." So Man Utd are going to beat Barcelona because their manager had a win 20 years ago as a player against - err - Bayern Munich? Manchester City and Pep Guardiola's former club Barcelona, with whom he won the Champions League as a player and coach, are in separate halves of the draw so could meet in the final. 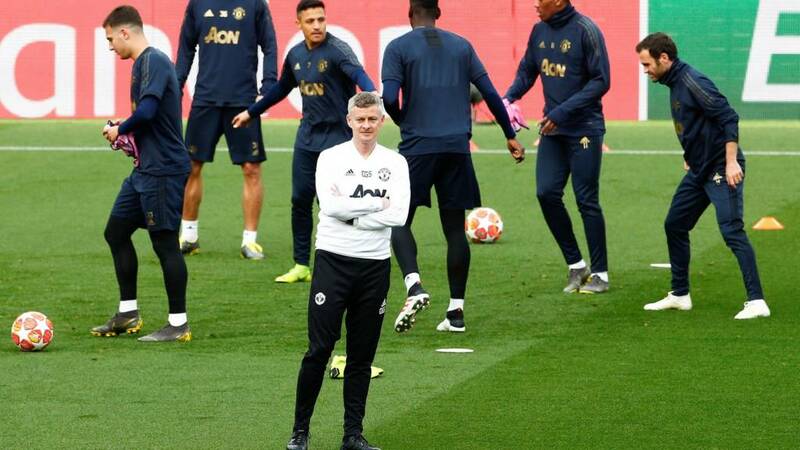 Barca welcome Manchester United later and it will be the first time United boss Ole Gunnar Solskjaer has played or managed at the Nou Camp since scoring the winning goal for United in the 1999 Champions League final. Tottenham have injury concerns with Harry Kane ruled out and Dele Alli doubtful. But City defender John Stones said: "Harry and Dele might not be playing but we can't concentrate on that. I just want to focus on us, do everything we can to get the outcome we want." On the pressure of going for a quadruple: "I think you get the best out of yourself when you're under that pressure and scrutiny." Abdullah Ali Yusuf: Is Guardiola playing mind games? Let Spurs know his team is in Champions League next season. I think Spurs will get result to go through. They are different team in Champions League. Pep Guardiola confirmed that Oleksander Zinchenko was not in training today but Fernandinho returned to "low-medium intensity" on Monday. Manchester City play Tottenham twice in the space of a week - in the Champions League on Wednesday and the Premier League on Saturday - before heading to Old Trafford to play Manchester United on Wednesday, 24 April. Pep Guardiola says those games are all "finals", adding: "The Premier League is the most important title - you have to be here over 11 months. "It will not be similar to the first leg," he added. "We need to score goals and we need more control." Prince Gyimah: Inasmuch as I would love Lionel Messi to lift the UCL trophy again, I think this time around my darling club Liverpool is going to bring it home. Liverpool have a 2-0 advantage heading into their second leg away to Porto on Wednesday (20:00 BST). Pep Guardiola was asked if he relishes the possibility of playing his former club Barcelona in the Champions League final. "I don't think that far away," he said. "I want to get to the semi-final and first to play a good game. That is the only dream I have right now. "Mathematically we have qualified for Champions League next season. We will be there. We will be in the draw in Monaco in August. I want to congratulate the team, the staff. "It doesn't matter what happens tomorrow as we will be there again." Manchester City manager Pep Guardiola says Tottenham are an "incredible top team" even without striker Harry Kane, who was injured in the first leg. "I want to win the Champions League," he said. "In football you lose more than you win. We always try and improve. We try to do our best and tomorrow we will see." There are still some tickets available for the game so both John Stones and Pep Guardiola were asked to give a message to the Manchester City fans. Guardiola said: "We need them, without supporters we cannot go through. I am curious how our fans are going to be tomorrow." Asked what kind of atmosphere he wants, Guardiola replied: "Like Liverpool [league win in January]...but a little better." Time for Hughton to show that he can motivate the players. We have seen some lacklustre and passionless performances this season. Nothing but a win would really be acceptable. Manchester City's news conference is now under way, with defender John Stones talking to the media about their Champions League quarter-final with Tottenham. City trail 1-0 heading into the second leg. "There's still everything to play for," he said. "We just have to get one goal and go from there. It's still so close. At the Etihad tomorrow it'll be a massive occasion and it's one we're really looking forward to." On a possible quadruple, he added: "That's the dream we are trying to achieve and definitely something we are fighting every day for. "These moments bring the best out of us. We have got to keep believing, keep playing and enjoy the pressure of playing in these big games. "I don't think a lot of things are impossible. If you don't dream big you won't get near it."